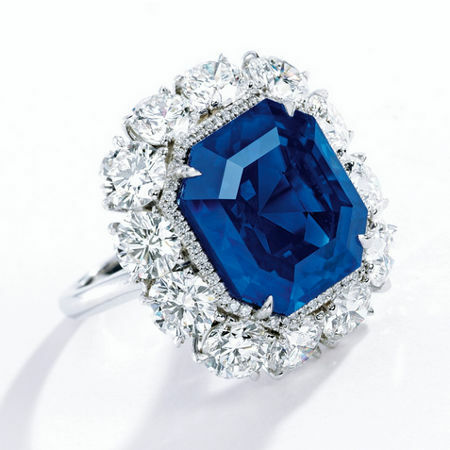 Blue Sapphire is the most popular color, the intensity of blue as the most important factor. For example, you may have a huge stone of many carats, but if the color is a washed-out, weak blue, then the value of the stone will be lower. Look for a stone that has an intense, rich blue without being dark or inky. Overall, sapphires that are too dark or too light in color are valued less. However, light blue sapphires often have a brilliance that is rarely found in the darker stones. Sapphires look best viewed with fluorescent light or daylight. Incandescent light is redder, and sapphires look less attractive in this lighting. Sapphire tends to be cleaner than ruby. Look for stones that are eye-clean. This means no inclusions that are visible to the naked eye. Actually, extremely fine silk throughout the stone can enhance the value of some sapphires. The famous sapphires from Kashmir have a velvety blue color which is caused by this fine silk. This silk is needed for the star effect in star sapphire, however, too much silk weakens the color, making it appear undesirably grayish. Various shapes and cutting styles are common with sapphires. Ovals, cushions, and rounds are seen, as are other shapes, such as the heart or emerald cut. Round stones can command a small premium. Cabochon-cut sapphires are also common. Used for star stones, the best cabochons are somewhat transparent, with smooth domes of good symmetry. Sapphires come from Thailand, Sri Lanka, Madagascar, Tanzania and Australia. The United States, Cambodia, Nigeria, Kenya and China also produce some sapphires. Perhaps the most famous sources for sapphires are the Kashmir region of India, and Burma. Discovered over 100 years ago, the Kashmir sapphire has a lovely, velvety blue color prized by gem lovers. Burmese sapphires can also be fine, but like the Kashmir region, these two areas today produce very little material. Today Sri Lanka and Madagascar produces most of the fine sapphires on the market. You can find a wide range of beautiful blues, from soft sky blue colors to deeply saturated hues. In addition, the Kanchanaburi region in Thailand and the Pailin region in Cambodia are renowned for deep blue sapphires. Tanzania, an old producer of sapphires in other colors, is now starting to produce blue sapphire from new deposits in the south. The most common treatment for sapphire is heat treatment. Stones are heated (generally before they are cut) to between 1700 to 1800 degrees Celsius (3100-3300 degrees F) for several hours. Most sapphires today are heated, and the stones of rich blue that are not heated can command enormous prices in today’s market. Some blue sapphires may also be diffusion treated, though this treatment is more common for star sapphires. Beryllium treatment is now being used to produce stunning orange and red colors that were once rarely seen. All sapphire treatments should be fully disclosed by any reputable dealer. Questions about Sapphire or other aspects of Gemstone? Ask an expert of Moti Kashi Diamonds for answer. Our experts will answer any questions you have, and if you like, search for Ruby on your behalf that match your criteria.